Mr Keigher posted on the Labtech forums that wouldn’t it be great if there was a Printer Status Plugin for Labtech that could show if there were any issues with a printer and maybe even interact with a failed printer. Well Marty your ship has come in! 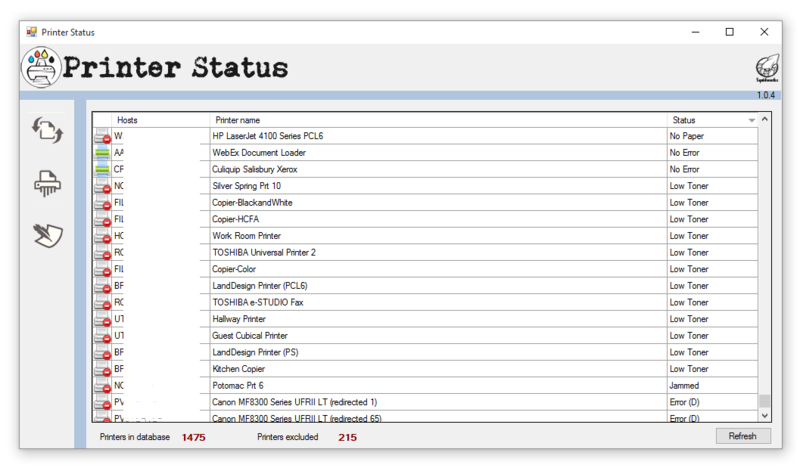 Let me introduce you to your new Printer Status Plugin. The team down in Squidwork’s basement went to town taking what seemed like minutes (and it looks like it) to build a Labtech plugin that would do what had to be done. In Version 1.0.4 you have good management over printers in 2 main views; the global view and the client view. The Global view allows for the full management suite of tools to be executed on any printer being scanned and will give you a quick view in to the troubles your clients maybe having. The Client view provides the same management functions but also allows you to enable and disable scanning for a client and to include desktops in printer scans. I’ll get it installed today (been out of town for a bit), and will give you some feedback pretty soon! I installed your Plug-in today and the printer data is not being populated as of yet. Does it take a few hours to populate or is there something else that I need to do as well? New to the LT Customizing Community. Thanks. Nevermind, I was able to get it running. Thanks. Great tool!!! The printers tab shows up but there is nothing there. You mention a second script but there was only one and a DLL file in the archive. Am I missing something? This is a new LT install on an AWS instance of 2008 R2. It’s patched and updated Windows-wise and the LT updates have been applied, but not much else has been done to it. The rest of LT seems to be working fine. I’m assuming there’s just a .Net library or something missing but without a working system to compare to it’s a bit difficult to ascertain what it might be. here is the sql query to create the table needed for this to operate. Copy and run against the LT server to create new table. Thanks for that, but read on for more exciting details! Yes, a restart of the LT database agent may also resolve issues like you were seeing where system just failed to create DB tables. Any plans on adding it at the location level? Also, Is their a way to display the friendly name instead of the computer name of these plugins? Really like what youre developing for LabTech. May I add a feature request? Exclude redirected printers or make an option to choose if they may be excluded. And how do I delete a printer like a redirected one from the DB? The rows I select are unavailable for deletion. I am having a similar issue as above. There was only one dll to load and I loaded it. 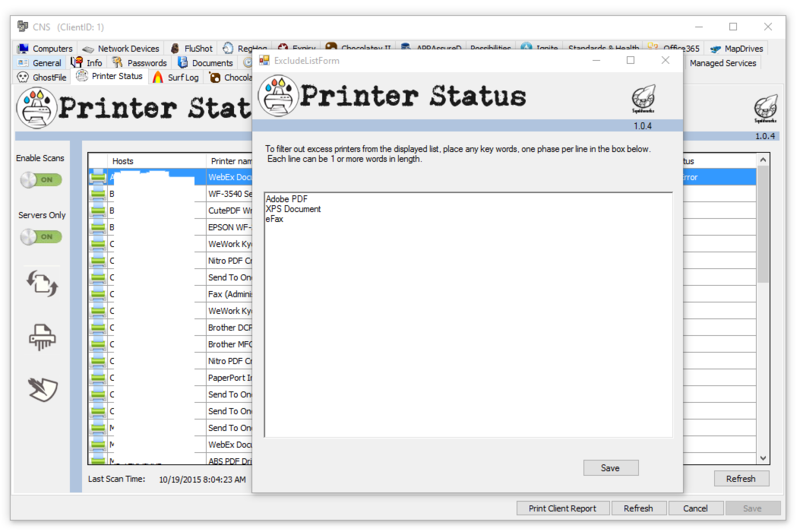 The Printer Status tab appears but there is no data. Does it take time to populate? Eric, The zip should of come with a XML to import using the importer under the tools menu in LT console. Once this is done you will need to schedule the new script to a group. I normally tie it to my 24/7 windows groups to run every few hours. When the script runs against the group you assigned it to then those systems will have printers showing up with in their tabs. 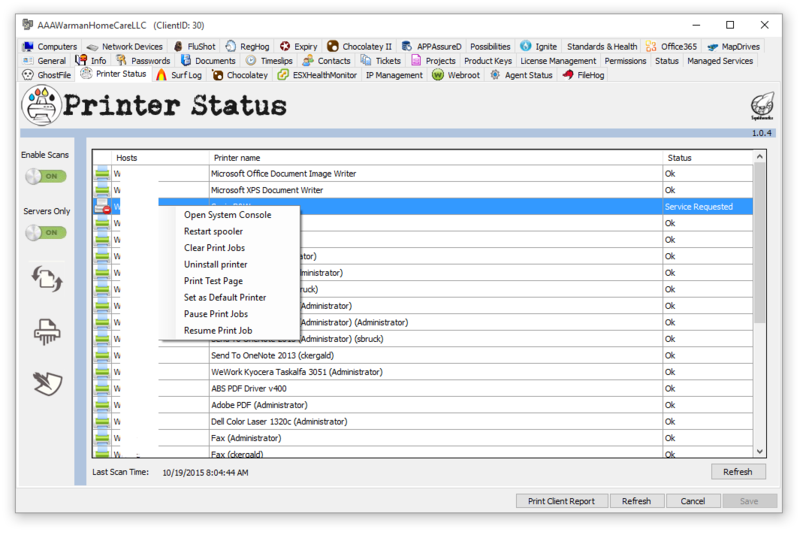 so search scripts for “Get Printer Status” to find where the script is and schedule it against your windows groups. Next question, what is it querying? Just the spooled jobs? Is there any way to setup alerting on the failed statuses? we just released version 1.0.4 with many improvements, so much so you will need to come and check it out. Very cool stuff and much better control with ease of use. Thanks for making great plugins! When I download this I am only seeing a dll file but no XML. Is this correct? That is correct, The new plugin auto creates the scripts now. Totally new to LabTech – just downloaded and installed v1.04. The tab appears under the client, but it is empty. I enabled scans (first option), but how do I control how often the scans occur? I tried searching for the “Get Printer Status” mentioned in comments above, but cannot find it. Is there a new way of scheduling scans in v1.04? Any issues running this in 10.5? the script isn’t created automatic. i have a Gemran labtech Version. Can you publish the PrinterStatus script code? over night the script now exists. Verry Good. This script is not running on our cloud server. Database exists from the text provided above. Just tried to load this on a LT10.5 system, but getting an error on load. Is it 10.5 ready yet?? So i can see this page hasnt been updates in quite a while and the last question asking about 10.5 wasnt answered.. so does this work with 12? i have it installed, it will pull open a page that shows levels, but i would like to create a low toner alert. will this work with Automate 12? Printer status doesn’t seem to be running any scans for us.